Thanks to crowdfunding, comics publication is becoming more accessible than ever before, and with every passing day there are more and more independent comics projects vying for backers. The influx of campaigns at Kickstarter, IndieGoGo and elsewhere can get just as overwhelming as trying to find a new comic to try on the shelves at your local shop. If the premise looks interesting, how likely is it to get funded? What tiers offer the best values for backers? Paste Comics is committed to bringing you regular coverage of campaigns across the internet that offer not only exciting new ideas, but a solid investment and good value for your money. This month we’re ringing in spring with a fresh batch of crowdfunding campaigns. Rachel Pollack and Richard Case have a story in this anthology. I’m not saying that’s the sell, but Dead Beats features Case and Pollack’s first collaboration in more than 25 years, and given how good that previous one was, I’d say their inclusion in A Wave Blue World’s latest anthology campaign makes this a can’t miss. 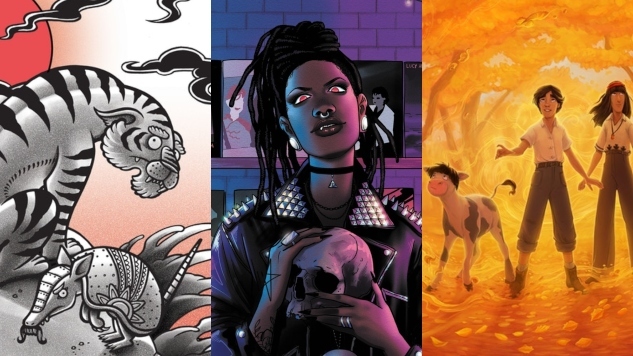 A collection of music-themed horror comics centered around a supernatural record store, Dead Beats will be a 160-page full-color anthology featuring some incredible talents edited by Joe Corallo (MINE! Anthology) and Eric Palicki (This Nightmare Kills Fascists). The roster includes Vita Ayala, Nadia Shammas and what’s bound to be a fantastic story from Steenz and Ivy Noelle, whose OGN Archival Quality I recommend picking up after the campaign closes. This is A Wave Blue World publishers Tyler and Wendy Chin-Tanner’s sixth Kickstarter anthology; they’ve got a strong track record with campaign fulfillment, and this campaign surpassed the 50% funding mark within days of launching. There are two different digital-only tiers that are both solid values—$10 for a PDF of the full anthology, and $15 for the anthology and backmatter—while the $25 print tier is a great value for print and digital copies, including the backmatter, and a sticker to boot. (If you’re a comics pro with money to spare, though, I highly recommend the pitch/portfolio review with new AWAB editorial director Joe Illidge.) Dead Beats wraps on May 9th. Little Red Bird Press is a comics micropublisher founded by Gerardo Alba and Ally Shwed, and they’re aiming to bring three new comics into the world with a campaign that wraps within the week. The 2019 Little Red Bird slate includes my personal favorite, Bearplane, a playful look at one person’s trip on a long flight with a bear for a seatmate, as well as Gerardo Alba’s stunningly illustrated Back Piece about a tiger tattoo artist and Zak Kinsella’s fantasy tale Burn. Little Red Bird Press has several successful campaigns under their belt and, as of the Kickstarter launch, art is already in progress and on-schedule for a year-end delivery. Just $6 will net you a PDF of one book, while $15 will get you PDFs of all three—all are roughly the length of a single-issue comic, aside from the slightly longer Back Piece, so this is a pretty reasonable price. There is an extremely cute embroidered patch available of the traveling bear in the $40 tier, which will also score you PDF and softcover copies of all three comics and two other patches, and is a great choice if you like a little extra swag in your kickstarter campaigns. The Little Red Bird Press 2019 Collection campaign ends on Wednesday, April 17th. Sci-fi is often about bombastic adventures in worlds far removed from our own, but Planetside: A Sci-Fi Slice of Life Comic Anthology seeks to explore the lives of everyday folks living in extraordinary situations. What’s a day in the life of a sci-fi veterinarian? Jolly Squish’s “Dr. Sirius” will tell you just that, and Jolly’s whimsical style and comedic timing make it a particularly eye-catching inclusion in the anthology. Ryan King and Johnny Herber offer up breathtaking black and white artwork in “Your Everlasting Gaze,” and while there’s no preview art, I can promise that illustrator Kevin Jay Stanton’s entry will be truly beautiful to look at based on his previous body of work. Planetside is edited by Thea Ferrara, who has experience participating in other campaigns such as the Valor anthology, in tandem with Annie Stoll, an experienced hand at project management on such a large scale both on Kickstarters and in the music industry, who previously worked with Stanton on the massive 1001 Knights campaign. $10 will net you the PDF of Planetside, while bumping up to $18 will get you a sticker and a gorgeous enamel pin designed by Grace Teoh. Planetside is complete and is essentially ready to send to printers contingent on full funding. The campaign ends on April 26th. The Under the Cottonwood Tree Kickstarter starts off strong with an absolutely gorgeous cover illustration from artist Margaret Hardy. Hardy’s warm, inviting artwork is engrossing and fantastical—the perfect match for brothers Paul Meyer and Carlos Meyer’s graphic novel, a New Mexican/Latinx folklore tale that follows two siblings and their friend on a quest to free baby brother Carlos from a magic spell. Don’t scroll too far here for there are some spoilers, but the Meyers offer up a free preview of the full first chapter of the graphic novel that’s every bit as charming and beautiful as the campaign page promises. $10 will net you a PDF copy of the book, and if you’re looking for something extra, I strongly recommend the Fan Package, a $30 tier that offers a PDF and softcover copy, a bookmark, three cute buttons featuring art from the book and a copy of the original, shorter of this story, “The Calf, the Caterpillar, and Joey,” illustrated by Paul and Carlos’ older brother Julius. The campaign for Under the Cottonwood Tree ends on May 1st. There should really be more comics about organizers, and writer Henry Barajas delivers with the deeply personal La Voz De M.A.Y.O. Tata Rambo #2. After successfully Kickstarting the first issue in 2018, Barajas returns with a second installment about his great-grandfather Ramon Jarigue, co-founder of the organization Mexican, American, Yaqui, and Others (M.A.Y.O. ), who fought to gain federal recognition for the Yaqui tribe and help provide a voice in the face of local Tucson government efforts to displace Yaqui residents. Just the sample pages on the campaign page will tug at you—Barajas has a thoughtful and powerful voice, elevated by artist J. Gonzo’s bold, distinctive style. Go for the $12 digital issue #1 and #2 combo or the $25 Second Chance tier here, which will net you physical and digital copies of both issues as well as a pin. This project has a fairly modest goal of $7800 and hit 30% in just over a day; this is a solid bet to hit full funding and should be a fairly straightforward fulfillment. If you do back, keep your eye on the stretch goals—they’re aiming to release issue three later this year. The campaign for La Voz De M.A.Y.O. Tata Rambo #2 ends on May 11.